The sun is out this morning, but the players have a chance to sleep in. Thanks to the wet weather on Sunday, manager Don Wakamatsu changed the starting time for today’s intrasquad game to 1 p.m., so players don’t have to be dressed and ready to go until 11 a.m. The lineups have just been posted and the “home” team has most marquee names. Home: Ichiro, RF; Chone Figgins, 2B; Milton Bradley, LF; Ken Griffey Jr.; DH; Jose Lopez, 3B; Casey Kotchman, 1B; Eric Byrnes, CF; Jack Wilson, SS; Josh Bard, C and Ian Snell, P.
Visitors: Michael Saunders, LF; Ryan Langerhans, CF; Ryan Garko, 1B; Mike Sweeney, DH; Jack Hannahan, SS; Michael Wilson, RF; Matt Tuiasosopo, 2B; Adam Moore, C; Josh Wilson, 3B; Jason Vargas, P.
Another, shorter, intrasquad game will be played tomorrow, leading up to Wednesday’s Cactus League opener against the Giants at Peoria Stadium. Among those being watched the closest is Tuiasosopohe, the former Woodinville High three-sport star was a spring hit a year ago, when he batted .424 in 23 Spring Training games and earned a spot on the Mariners’ 25-man roster. 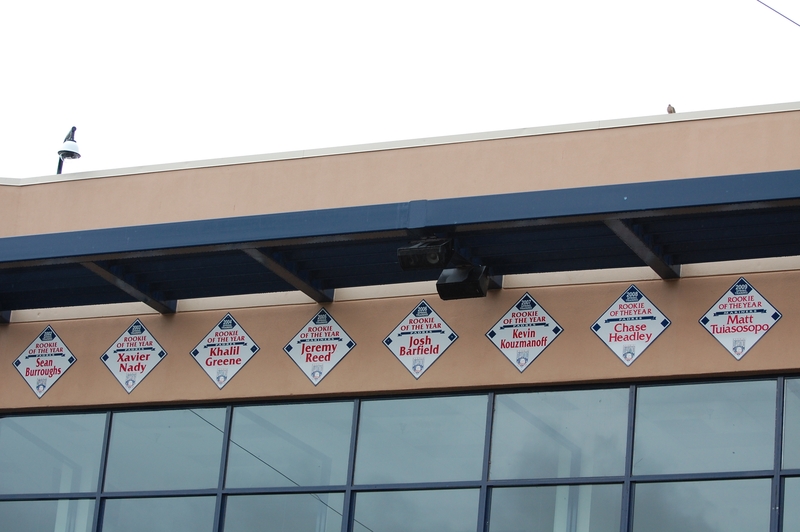 He also was selected as the Peoria Sports Complex Rookie of the Year (as depicted in above photo). Later today, a story on Tui’s terrific camp last year and what lies ahead of him for this spring will be posted on the Mariners web site.